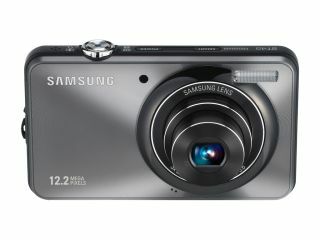 Samsung has launched the new ST45 compact camera, with a 16mm thin frame and an ultra light chassis. The 12MP snapper has a 2.7-inch QVGA screen for showing off your snaps, and a whole host of pre-set scene modes with Smart Scene Recognition to choose between them. That means that if you're out in a bright field or in a dingy bar the ST45 will have a good look at what's around and change the settings accordingly. There's also Digital Image Stabilisation, Face Detection, Blink Detection and Beauty Shot too on the ST45. Frame Guide is apparently included to stop strangers taking rubbish pictures of you with your camera on holiday, where you take a picture of what you want to see when you're in the photo and a ghost image will display so they know what you want in shot. The ST45 can handle bright shots up to ISO setting 3200, and has Smart Album abilities where the camera will group shots by date, content, theme or even colour depending on your preference. The new camera has a UK release date of later this month, although we're still waiting for a price on the ST45, which will be available in red, black, blue and grey.